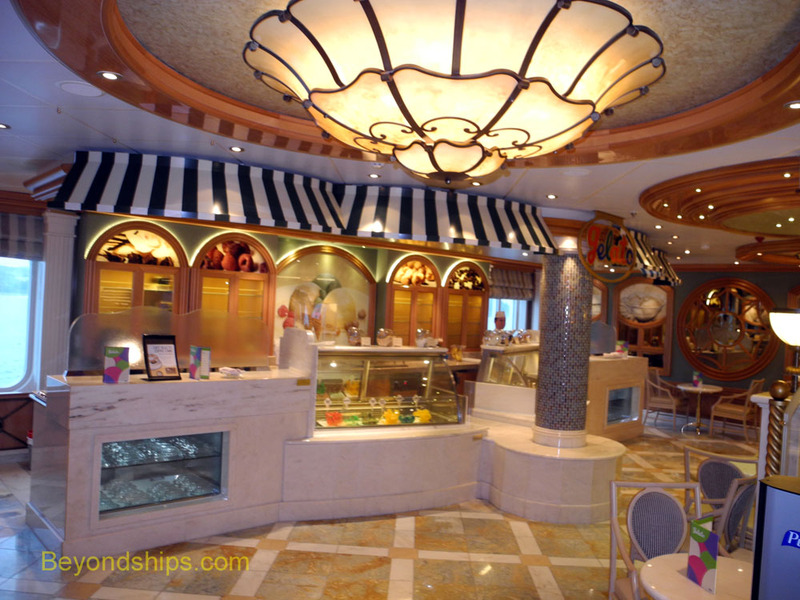 Readers familiar with the Princess ships will recall that the Princess ships have traditionally featured an ice cream bar, usually located by the main pool area. It offered cups and cones with a choice of one or two flavors. With Royal Princess, the line has completely re-thought its ice cream offerings. There is still a complimentary ice cream venue called Swirls by the pools. But in addition, there is a specialty ice cream venue. Gelato, located on the starboard side of the Piazza is a more elegant venue, offering a wider range of flavors and ice cream creations. 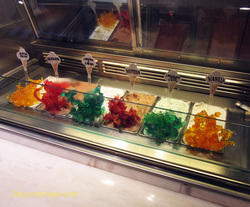 Despite the Italian name, Gelato is an American style ice cream parlor. The counters and tables are done in white and the overall décor is reminiscent of the classic American venues of the first half of the 20th century. The ice cream is also American style. It resembles the ice cream at Baskin Robins or Haagen Das more than the ice cream that can be found in the Piazza Navona in Rome. Inasmuch as Gelato is just the Italian word for ice cream, it encompasses all types of ice cream and not just Italian-style ice cream. Gelatto carries eight flavors of ice cream. Of course, this includes the three basics - - chocolate, vanilla and strawberry. But there are also some more sophisticated offerings including nutella, cookies and cream, mint chocolate chip, butter pecan and dulce de leche. Of course, you can have your ice cream au natural or you can have it embellished with an array of sauces and toppings. These include such stalwarts as hot fudge, chocolate sauce, sprinkles and whipped cream. However, you can also have Oreo cookies, M&Ms, and all sorts of fruits. You can have your ice cream in a cup, in a waffle cone or as a sundae. You can design your own sundae combining the various flavors, sauces and toppings or you can order one of eight designer sundaes. Inasmuch as you can create your own sundae, the attendant will allow some substitutions in the designer sundaes. For instance, in the banana split, I had mint chocolate chip ice cream rather than the vanilla that is specified on the menu. The menu also lists two “Alcoholic Sundaes.” These are basic vanilla sundaes with either Irish cream or Frangelico licquore added. With the alcohol, the sundae is twice the price. As of this writing, the price for all of Gelato's non-alcoholic offerings is $2.75. (All the offerings include three scoops of ice cream). However, another option is to use a pre-paid specialty coffee card to pay. One click will get you one of the non-alcoholic offerings and two clicks will get one enhanced with spirits. Above: Three scoops au natural. Above: A modified designer banana split.